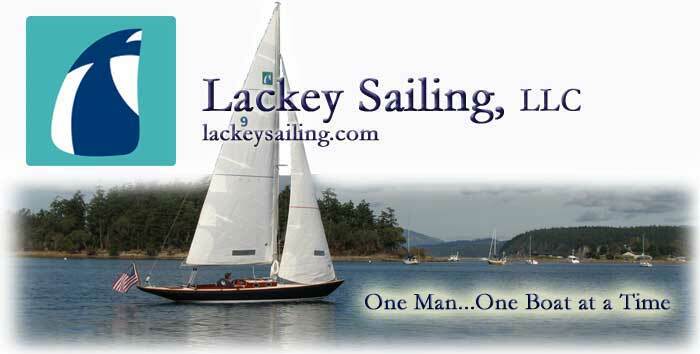 The opportunity to set up a new shop, fine-tuning setups and correcting mistakes from past shops, is always fun. 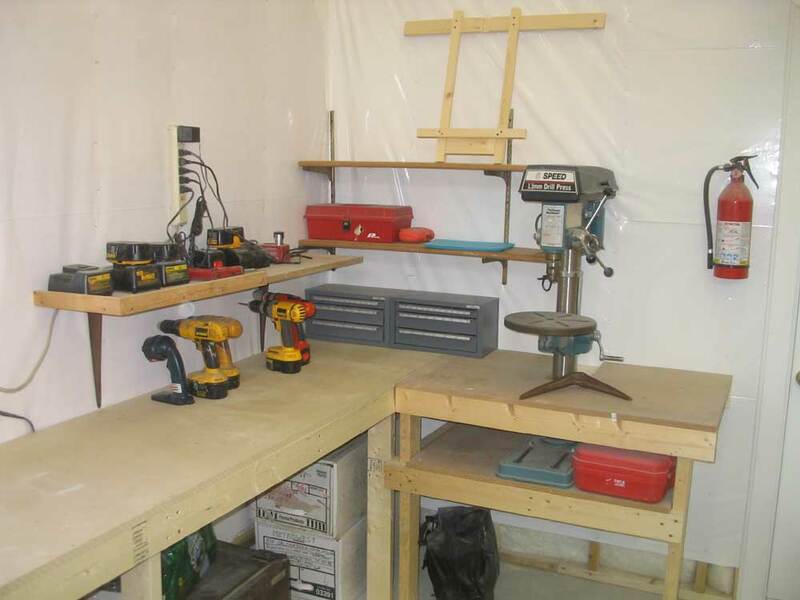 In this case, I had been pleased overall with the way my "old" shop, located at the back end of my old shop building, had worked and, with a similar layout to work with here, I planned to keep things more or less in the same configuration. However, I planned a few changes. 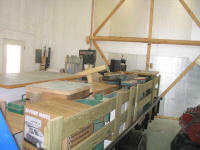 First of all, I had a rectangular space that was about 28' long and 20' wide, all dedicated to the workshop; in the old setup, I had a similarly-sized overall space, but there was no definition between the woodworking tools and the boat storage area, so the shop ended up being in and amongst the boats. Still, the long bench across the back wall and the general tool configuration had worked well, and I planned to emulate the overall setup. With dust always an issue, this time I planned to be nearly fanatical about closed-in storage spaces. Fortunately, I had several completely separate spaces in the new shop in which to store certain materials and supplies--a storage and utility room directly off the shop (also containing the oil burner); the dedicated paint and finishing room upstairs, and isolated from the shop; and, of course, the huge raw storage of the attic, a nearly unfillable--if non-temperature controlled--space that was available. 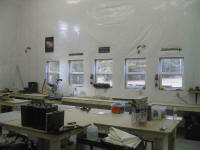 In addition, I planned for all storage areas in the main shop to be covered with solid doors to keep dust to a minimum. Storage areas, however, would come a bit later on. 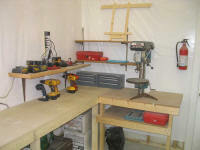 First I needed to set up some critical tools and benches. After 10 years of faithful service (and the saw was used when I obtained it) , I decided to retire my old Craftsman contractor's saw and replace it with a Delta X5 3HP 220-volt cabinet saw, complete with 52" Biesemeyer fence. 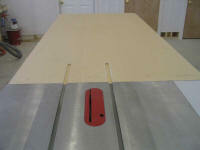 The saw came with a free mobile base that I figured I might as well use, though I planned for the saw to be stationary. 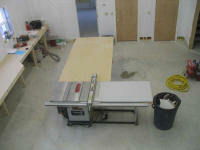 Located in the center of the shop, the tablesaw would be the main shop feature. 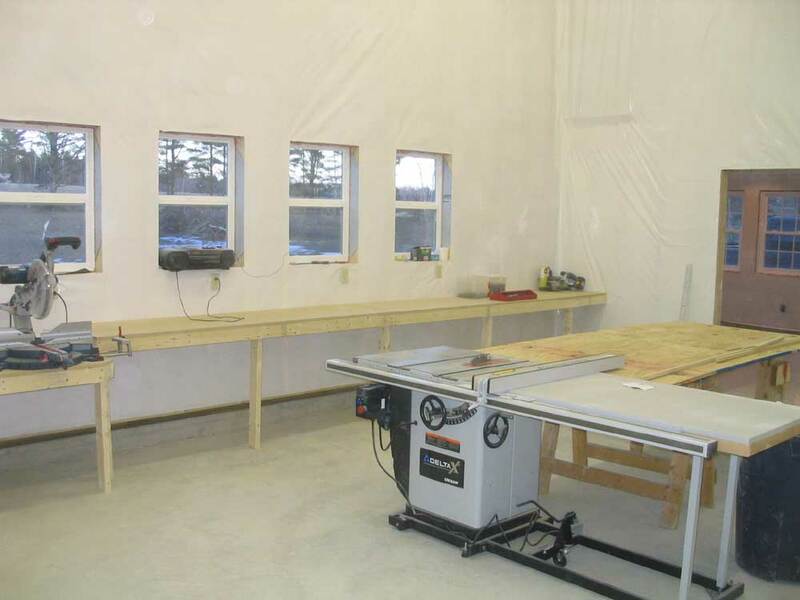 I planned to surround it with large outfeed tables which would also serve as work surfaces for the shop, in addition to the main bench along the back wall. To help me along during the initial portion of shop construction, I threw together a temporary outfeed table using a pair of sawhorses, an old door, and a sheet of plywood. 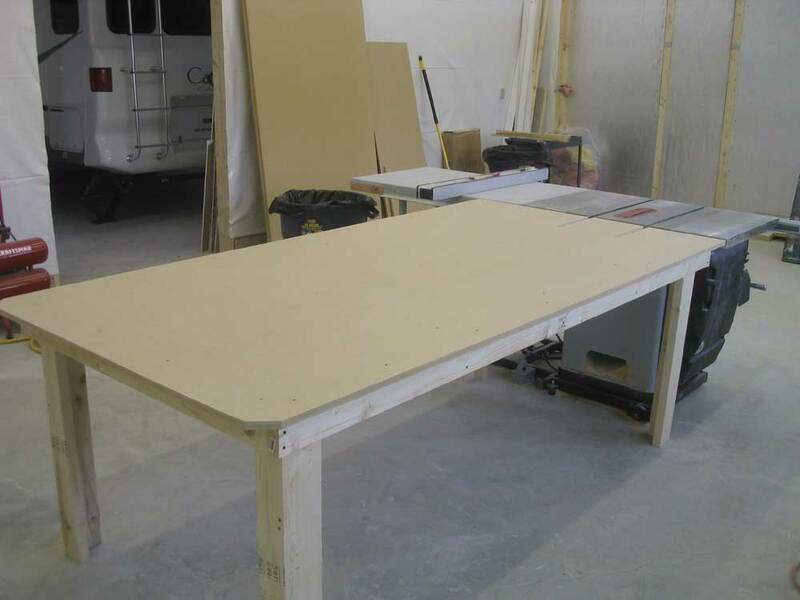 While inelegant, this outfeed table proved invaluable for milling the MDF for the long shop benches and the trim for the office. But I had bigger and better things in the works. 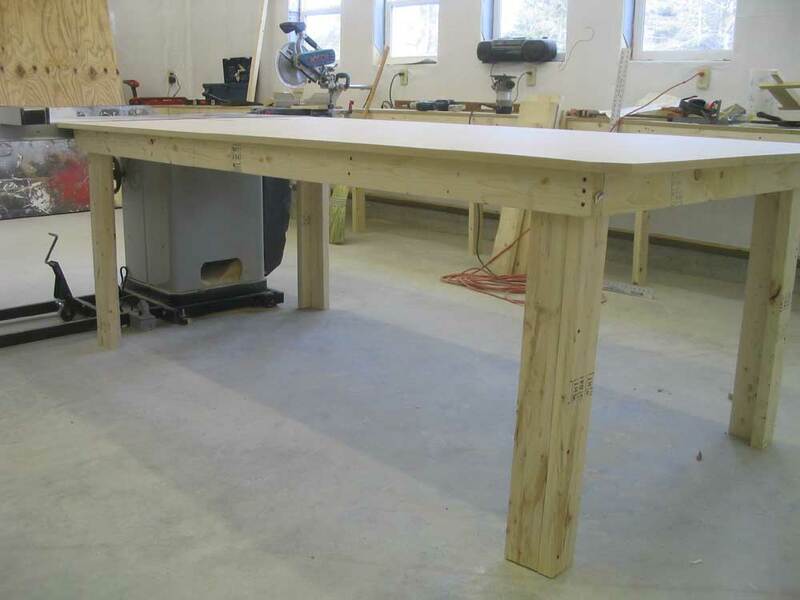 Some time ago, I saw a project on the New Yankee Workshop where Norm built a nice work table featuring a unique and simple caster arrangement that allowed the table to be easily lowered off the casters, making it stable and affixed in position, but could also be easily moved about using the simple caster setup. I thought this seemed like a great solution, since I didn't want most of my shop fixtures to be, well, fixed. 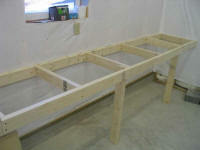 I built the basic table frame and legs from 2x4 lumber, attaching everything with 2-1/2" drywall screws. Since I was awaiting a shipment that included my casters, I forged ahead with the basic table, planning to add the caster assemblies later on. The height of the table was designed to be just barely lower than the table saw table. 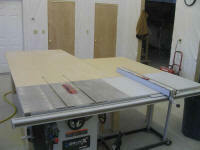 Over the frame, I installed a full sheet of 3/4 MDF, allowing plenty of overhang on all edges for clamps, etc. 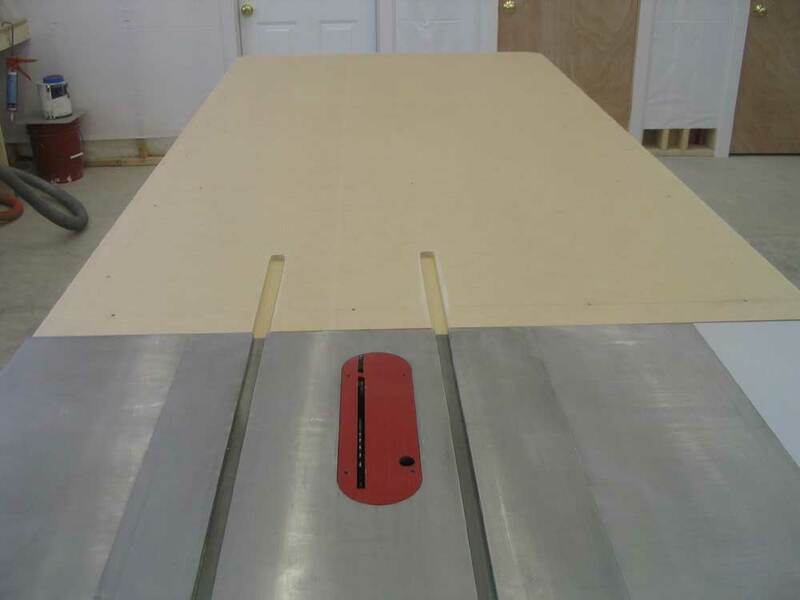 At the saw end of the table, I used a simple jig and a router to mill two slots for the table saw miter gauge, which needs to pass beyond the table when in use. Several days later, armed with more materials, I built the second section of the outfeed table. 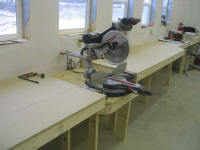 This section was quite a bit smaller and shorter, designed to fill in the space in front of the extension table on the saw. 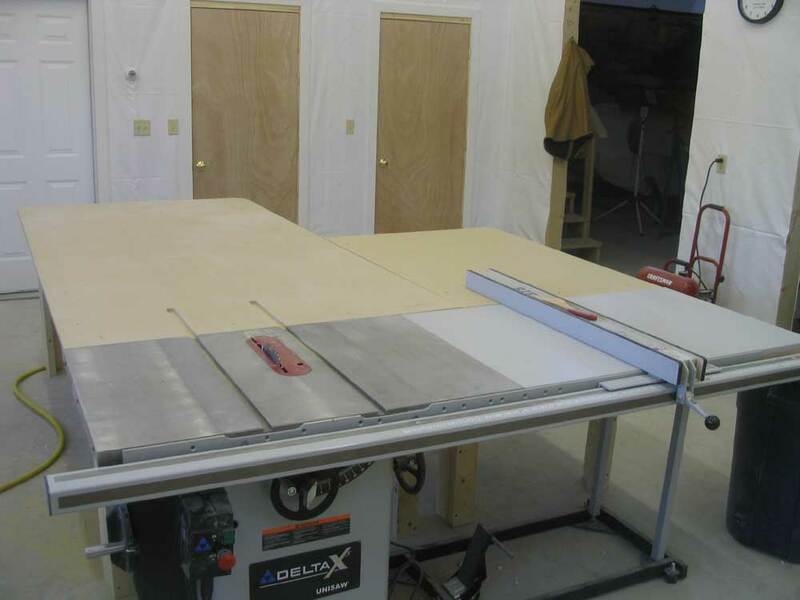 Since this wide width would only be used when sawing sheet goods like plywood, I decided the second part of the outfeed table only needed to be 4' long--enough to support the plywood width. This would keep some extra floor space free, and save on the materials as well. I built the second section in the same way as the first, only with a more diminutive size. Thanks to some twisty 2x4s, one corner of the new table ended up being a bit high, causing rocking; I solved this, at least for now, by sliding a shim beneath the offending leg. 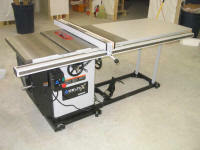 The time had also come to replace my venerable Ryobi 10" straight miter saw, which was functional but lacked any ability to cut compound angles or wide stock. 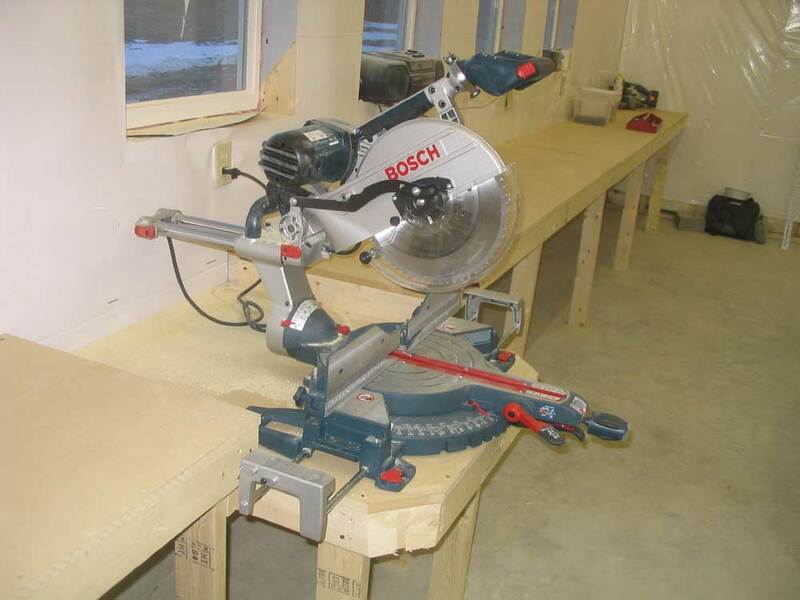 I purchased a Bosch 12" sliding compound miter saw after a fair bit of research into the various choices; the Bosch saw, a late entry into the list of consideration, seemed to have an excellent combination of features, performance, pricing, and quality. The fact that I could get free shipping and $110 off the regular price didn't hurt, either. My initial opinion of the saw, after a fair bit of use during shop construction and trimming out the office, is extremely positive. 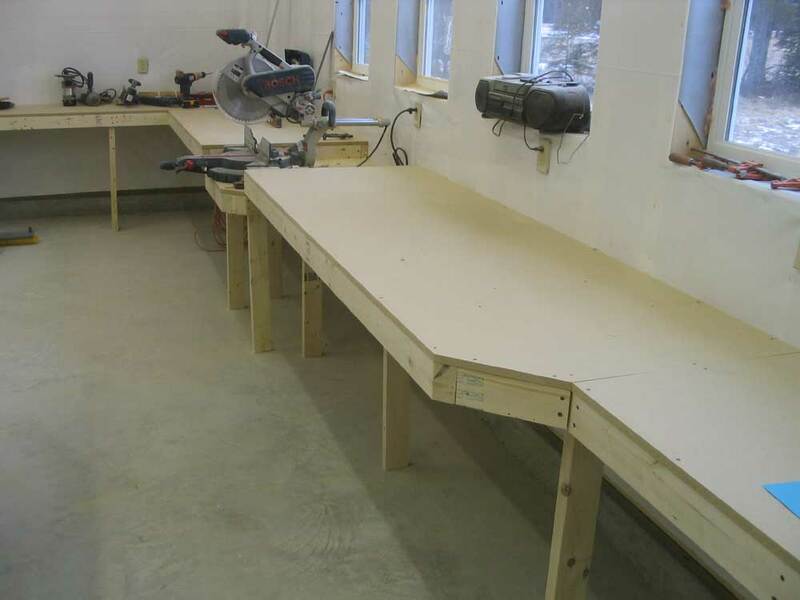 I built a long bench against the back wall of the shop, running the full 28' length of the shop. I built a framework out of 2x4 lumber, with a cleat secured to the wall studs and vertical legs every so often as required, and covered the top with 3/4" MDF board, which makes an outstanding work surface--smooth and durable. I also ran one section of bench along one of the adjacent sidewalls (incomplete in these photos). 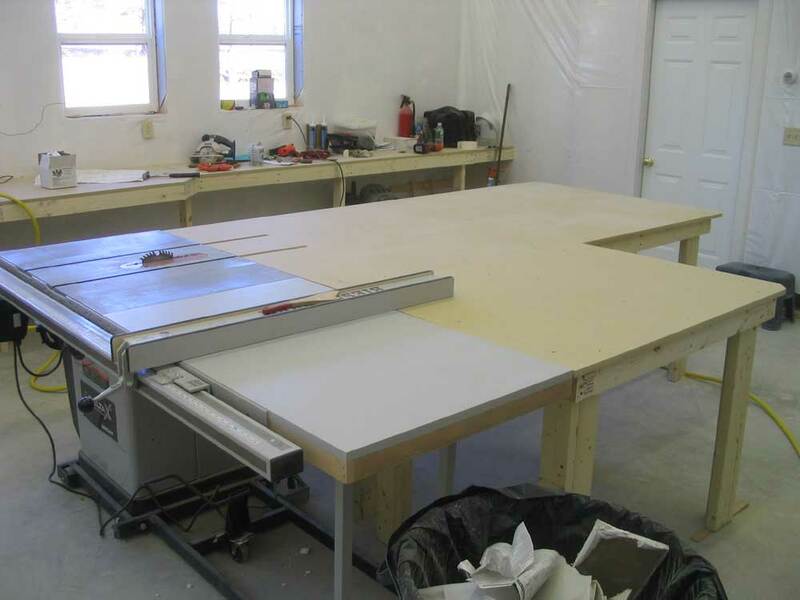 Keeping the benches at 24" in depth allowed me to get two sections of countertop out of a sheet of the MDF, minimizing my materials use. Since I do most of my work on freestanding benches that offer 360° access, the smaller surface afforded by the 24" main bench never poses a problem. To accommodate the miter saw, I built a lowered section of bench wide enough to accommodate the saw base, and designed to keep the saw table flush with the adjacent benches. Unfortunately, I realized too late (after all benches had been built) that I had erred in my concept, and that the saw--which required substantial back clearance to allow for the rails on which the saw slides--would end up too far forward to enable the main benches to be used as table extensions. Oops. Fortunately, a solution was simple, though I wish I'd planned better at the onset. To resolve this issue, I widened the benches on both sides of the saw. On the righthand side, I removed the 2' piece of countertop and replaced it with one cut to 32" width, which matched the side of the chop saw platform. The countertop, with a fairly short overhang, didn't require a lot of additional support, but I installed 2x4 edging to match the remaining countertops, with some bracing as required. On the left side, I added a 12" piece to the leading edge of the counter, since replacing the whole section was less feasible here thanks to a 90° countertop that merged at the corner. I built a supporting framework and applied the 12" countertop piece over the top, bringing this section out just a bit further than the righthand side. Perhaps I should have extended the right countertop to 36" as well, but I didn't want the section to extend inconveniently into the aisle. In any event, these simple extensions provided me with the support needed for longer pieces of wood, in both directions off the saw. I used shims to raise the saw slightly, so that the saw table was barely above the countertops on each side, ensuring that the workpiece would sit flat on the saw table for most accurate cutting. 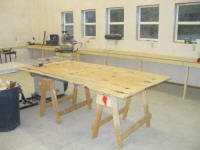 I recycled a drill press stand that I built for my shop in North Yarmouth, and adapted it to the new location. 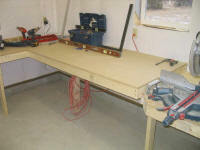 The stand lowers my bench-mounted drill press to a more convenient height, and has a removable top surface to allow the table to be lowered for very thick workpieces. With my final projects completed at the old shop, I spent several days moving the contents of the old shop to the new one, bringing a fully-loaded 14' utility trailer load each day. 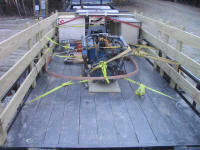 I'd load the trailer in the evening, then transport it up first thing in the morning. Over three days, I completed the move, and slowly began to incorporate the materials, fasteners, tools, benches, jigs, paint, sandpaper, and other supplies into the new building. Total organization of the new space would take time, of course, but I made great strides forward during mid-March, and the new shop began to feel like home.